Coma is the Greek word for 'deep sleep'. The definition is 'unarousable unresponsiveness'. 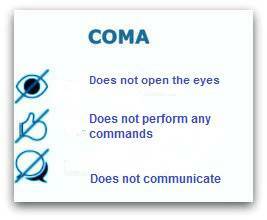 A person in coma cannot be awakened. For loved ones of a person in coma, the period of coma is often a horrible period of uncertainty and hovering between hope and fear. Coma is a state of deep unconsciousness due to brain injury. The brain cortex does not respond to stimuli. It may be a result of a cerebral hemorrhage or cerebral infarction, of oxygen deficiency, for example after heart failure, an accident with traumatic brain injury, poisoning or overdose, by alcohol intoxication, infection in the brains, and due to fluid accumulation in the brains (brain edema), for example after an operation. The patient is administered medications per infusion in order to reduce the intracranial pressure, that is to say, to attain the pressure of the brains and to reduce swelling of the brains. Also, the breathing can be controlled with the aid of a respiration machine. Sometimes a patient is deliberately kept in a coma (artificial coma) in order to limit (further) damage to the brains. In this way the damaged tissue will have the chance to restore as far as possible. This is often done by lowering the body temperature. A coma is caused by the fact that part of the brain functions has been interrupted or is working less well (functional disorder of the brains). Coma is not the same as braindead. When someone is braindead, there is no brain activity, not even of the brainstem. When a person is in a coma, his or her brain cells are still alive, but they receive no more signals from other brain cells. They do not send signals. Yet there is still a very minimal electrical activity and metabolism. With the most modern techniques sometimes very small isolated spots can be seen that show minimal activity, but do not pass signals. In a coma primitive reflexes like cough and swallowing may occur, as well as vegetative functions such as heart rate, blood pressure, respiration, temperature, and the wake-sleep rhythm is controlled by the brainstem. For people who are not in a coma, the brain stem has the function to control the activation and the alarm (arousal) of the whole brain. In other words, the brain stem contains the "on and off button" of consciousness. This is called the reticular activating system (RAS). The brain stem, midbrain, medulla oblongata, thalamus, red and black nuclei together constitute the reticular formation (RAS); the so called control room of consciousness. Nerve impulses enter here and are sorted and filtered and, if they are important, passed on to the cerebral cortex in the large brains. The cortex contains the function of consciousness. In a comatose situation consciousness disappears. 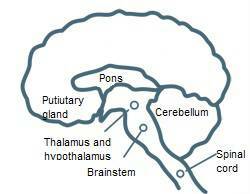 The reticulo-thalamo-cortical system controls the arousal state of the cortex (in the big brains). In the acute phase of a coma, the patient does not move at all or very little, does not respond to painful stimuli or on appeal. The movements that do occur in a later coma stage are reflexively, spasmodic, spastic and not consciously. The eyes are closed and the patient must be artificially fed and sometimes artificially ventilated. Fluid and nutrient can be administered through a tube or by infusion. The comatose state can go in three directions. The patient may gradually awaken from the coma (65%). The comatose situation can turn into a vegetative state, this is the chronic state of a coma. The patient may die (18%). The level of consciousness is determined by the internationally applied Glasgow Coma Scale to assess the severity of a possible head injury. Whether or not opening the eyes (E: Eyes), whether or not carrying out movements (M: Movement) and whether or not answers to questions are given (V: Verbal response) is measured with points. A person with normal consciousness has up to 15 points and a person deep in coma has a score of 3. This is recorded as E1M1V1 = 3. It is called the EMV score. If the score is less than E1M5V2 the patient is comatose. However, it must always be taken into account that there may be factors that affect the test: puffy eyes, deafness or hearing impairment or those who are intubated and therefore cannot speak. The consequences of a coma are hard to predict and the effects vary per individual. Patients who recover within hours or days have little effect. In people whose coma persists longer has 25-50% of life-long physical or cognitive consequences. In experience stories on this site are many stories of people who have experienced a coma. In the case that a coma is long lasting, i.e., for longer than a month, it is also called a non-responsive wake syndrome or Persistent Vegetative State (PVS). Previously, this condition was described as "coma vigil" or "apallic syndrome”. The person may slowly and gradually regain consciousness. Brain Parts are slowly "restarted". The eyes are open, but the responses to the environment occur exclusively by reflexes. The eyes can sometimes move but are unable to follow a movement. There is a sleep-wake rhythm. The more time passes, the less likely it is that the person later regains consciousness and is able to communicate or lead an independent life again. If the person reacts slightly to what is happening in the environment, but he or she cannot communicate, this is called low awareness state. The cortex is slowly beginning to function. The individual shows small but definite behavioral reactions. The eyes follow movements of people and there are more targeted responses to stimuli. Emotional reactions, such as crying and laughing, can occur, but it is not always in line with a reason, which makes it difficult for those involved to see it. The person in low conscious state can 'cry compulsively' making it seem that the person is very sad. A person in low awareness state may temporarily fall back into the vegetative state, but later on recover to awake. If people think they remember something from a coma, then it is at this stage. Stories continue to emerge from people who have memories of the coma and can repeat what was said, what was done. Because of this, it is wise to always remember that the person in a coma is a human being. Stay alert to what you say or do and involve the person in everything that you are going to do, so tell her or him what you are going to do. Also for example, in case of physical care, touch the person in a proper way. Do not talk about the person in a coma when he or she is present. Do not talk negatively. If someone has decided to turn on music or turn on the TV, bring some variety to this! Someone who is awake could also not bear to hear or see the same throughout the day. It is best not to put the sound too hard. The Locked-in syndrome (LIS) is like a coma. The person can hear and feel, but cannot communicate. It is almost always caused by a blood flake (stroke) in the 'pons' (an organ near the brainstem) or a stroke in the brainstem. The blood clot inhibits the blood flow from the portion of the brains that sends signals to the spinal cord. The story about a man who suffered a locked-in syndrome and for twelve years was not able to tell his parents that he understood everything they said is the remarkable and extremely sad story of Martin Pistorius (not related to the paralympic athlete Oscar).